Oklahoma City-based Continental Resources, Inc. announced Wednesday that it had a net income of $0.47 million, or $0.00 per diluted share, during the first quarter of 2017. First quarter 2017 net production totaled 19.2 million Boe or 213,755 Boe per day, an increase of nearly 4,000 Boe per day from the fourth quarter. Reflecting an acceleration, March production averaged approximately 222,500 Boe per day. Continental now expects second quarter 2017 production will be in a range of 220,000 to 225,000 Boe per day. Almost half of the company’s production occurred in the Bakken region during the first quarter. Continental has four operated drilling rigs working in the Bakken and plans to maintain that level through year end. The Company also has seven stimulation crews working in the play and plans an increase to nine by mid-year. Hamm also noted that Continental continues to expand the strategic scope of its premier assets with the Sycamore reservoir in Oklahoma’s SCOOP play. 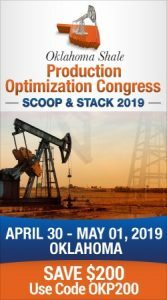 Continental announced its first two well completions targeting the Sycamore formation in Grady County, adding another highly productive layer in SCOOP to its portfolio. The Company has approximately 300,000 net reservoir acres in the Sycamore, which lies directly above the Woodford formation.